On a hot summer’s day, you may not be inclined to do anything too energetic; sometimes that can even mean taking a long walk. Autumn is much more conducive for that as temperatures tend to be slightly lower. The colours of autumn actually arguably make walking and cycling more attractive anyway. There may be a chill in the air early in the morning and indeed possibly some mist. Such times can be the best chance to capture a photograph that is a little out of the ordinary. 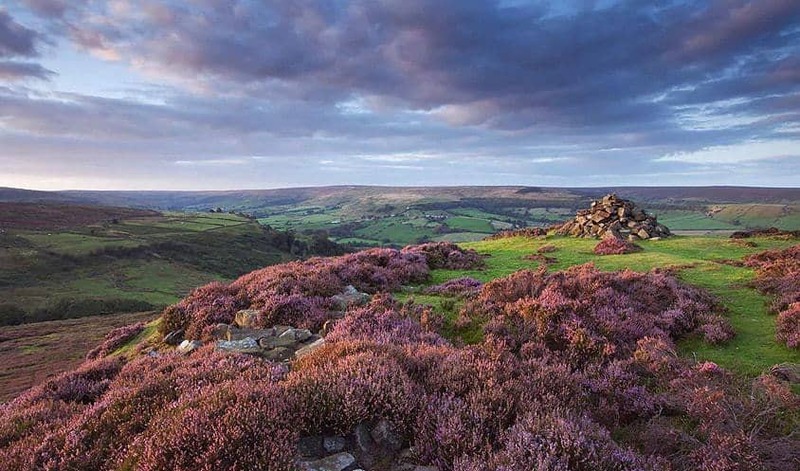 On the North York Moors, the heather on the moors comes out into flower, a wonderful vista of purple stretches out in front of you. On the coast, the weather can occasionally become unpredictable and the sea is beginning to lose its appeal. The harvest means that agricultural shows are on the calendar of some of the villages. If you are in Ampleforth or Husthwaite, try the first apple pressings; refreshing cider to go with the game being served in pubs and restaurants. Woodlands change with the season. They come alive in the spring and create vast areas of green in the summer but arguably the colours of autumn have them at their best, shades of yellow, orange and brown before the onset of winter. Greens fade but are replaced by many other hues. The vegetation starts to thin out revealing fungi that clings to wood that has fallen and died or has yet to fall. The Annual Guisborough Forest Festival held each September is a celebration of wood and brings together a host of people and exhibits to give visitors a greater insight into our environment. The cast includes artists, musicians, wildlife experts, birds of prey and people who have learnt a range of crafts; be sure to see the coracle demonstrations. You will need help if you want to identify fungi that is edible. Some are real treats and you can join the Yorkshire Arboretum who lead ‘’expeditions’’ into the woods to identify those you can eat. Alternatively, Tees Valley Wildlife Trust and Chris Bax from Taste the Wild both provide you with an insight into fungi and the pleasures of woodland areas and the natural environment. If you go back in time, you will get an appreciation of how important the railways were during the Second World War. 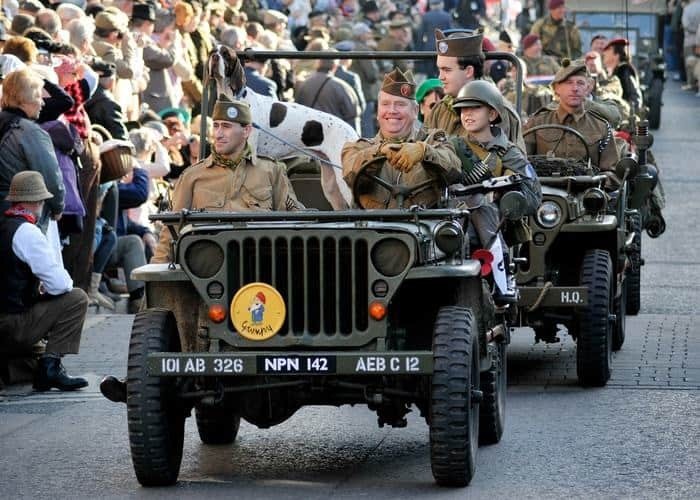 Between 12th and the 14th October there is a celebration with re-enactments, street parades and vehicles on display that will have you imagining what things were like in 1943. American GIs and British soldiers will help you picture those days long ago. Grosmont, Goathland and Levisham are the three places to head for to enjoy the long weekend. The North Sea was always known for its fishing grounds but less so for the larger marine life that it is possible to see. Whales move up the coast in autumn time following the mackerel and herring shoals and can be visible up until the first week of November. There are cruises out from Whitby throughout September with Whitby Whale Watching. Alternatively, head out of Staithes on the Real Staithes’ fishing boat, ‘’All My Sons’’ with either Yorkshire Coastal Nature or Three Sisters Sea Trips in the hope of seeing whales. Passengers regularly see Minke Whales, and others species including even possibly a Humpback Whale. An added attraction is the chance of observing harbour porpoises and white-beaked dolphins playing in the waters. Whitby Abbey and St Mary’s Church Graveyard were the inspiration for Bram Stoker’s Dracula. The clifftop setting adds to the aura of the place. What better place could there be for a Goth Weekend? The biannual Whitby Goth Weekend attracts people young and old, all interested in getting involved in Goth culture and fashion. Whitby becomes a town of dancing, shopping, music and general fun over a long weekend. 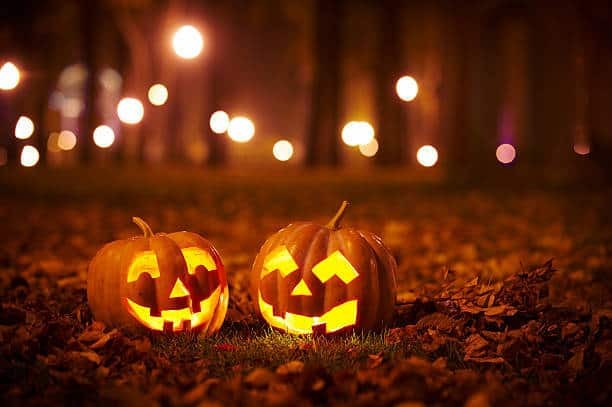 October finishes with Halloween and both Whitby and Robin Hood’s Bay join in the fun. There are “ghostly walks” among other things as celebrations get into full swing. 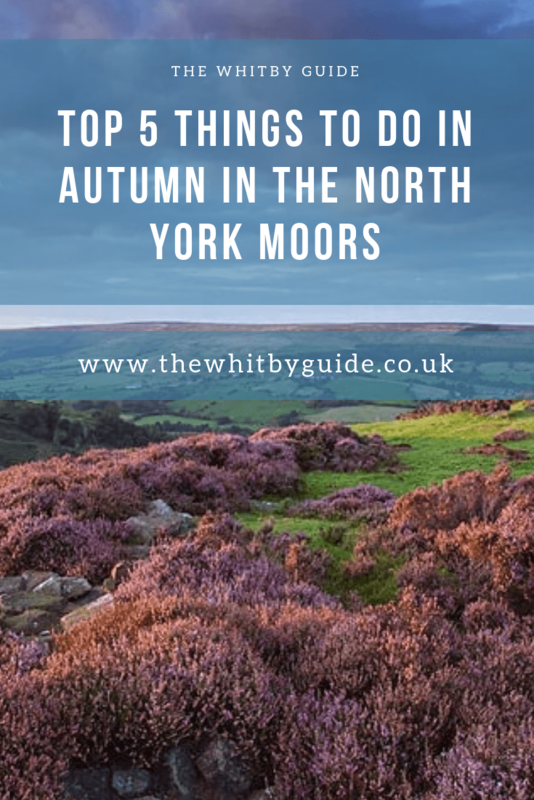 Loving autumn in North York Moors? Pin it!